If you’re working in CMYK mode, you’ll notice that many of the filters are "grayed out" in the filter menu, so you cannot access them. Rather than converting to RGB, which could affect colors, try this: go to the Channels palette and click on the Cyan channel. Now look in the filter menu and you’ll see that all filters are available. All you have to do is apply the same filter to all four channels, one at a time. To do this quickly, apply the filter to the Cyan channel, then press command-2 to activate the Magenta channel, and Command-F to reapply the same filter. Press Command-3, Command-F for the Yellow channel then Command-4, Command-F to apply to the Black channel. (One note: this doesn’t work as well with "random" filters such as Render Clouds). Using the Channel Mixer is a great way to convert a color image to grayscale, but it does take some experimentation. Another way to do this (with less control but excellent results) is to convert your file to Lab mode. In the channels palette, just click on the Lightness channel and then change the mode to Grayscale. For any tool that has a slider for Opacity (or Strength, Exposure, or Tolerance), don’t bother going to the Options Bar to change the setting. Just press the first number of the percent you want: for example, 1 for 10%, 8 for 80%, etc. Use 0 for 100. If the Move tool is selected, the same key strokes will change the opacity of your active layer (as long as the Layers palette is floating – it will not work if the palette docked). Just press the letters "d" and then "x" and your foreground color will instantly be white. Image too Large to Scan? Got an image that’s too large to scan in 1 piece? Simply scan each half, making sure there is a significant overlap between the pieces (for example, include the same person or portion of the building in each scan). 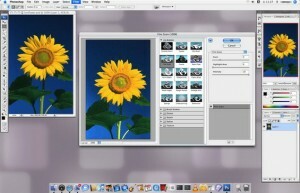 Then open both halves and use File>Automate>Photomerge to automatically stitch the two halves together.